If you are a regular reader at Content Marketing Institute, you know how often we talk about the importance of documenting your content marketing strategy. According to our latest research, we know that marketers who document their strategy are much more likely to accomplish their content marketing goals and be successful. It really is that simple. 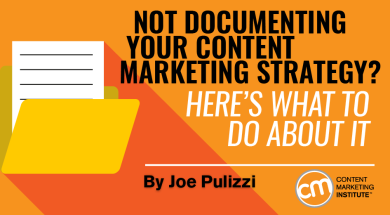 But, for some reason, we still see that the majority of marketers do not document their content plans in any way. In our latest study, just 37% of B2B marketers and 40% of B2C marketers have a written content marketing plan. While this percentage is up from 32% (B2B) and 37% (B2C) from the previous year, it’s still a woeful number. Here’s a simple approach for documenting your content marketing strategy. Dominican University’s Gail Matthews executed a study almost a decade ago. Dr. Matthews and her team found that those people who write down their goals, review them consistently, and share their goals with friends or colleagues are 33% more successful in achieving their goals than those people who just had goals. And we’ve found the same results in the content marketing industry. When we advise enterprise clients, we find that those brands that write a plan, review it consistently with their team, and treat that plan as a living document, adapting it as they receive data, are by far the most successful. What holds us back from documenting? Thanks to our amazing research team at CMI, we were able to collect and compile the major reasons why marketers are not documenting their strategy. By going through each one, my goal is to provide a few ideas or motivation for you if one of these reasons happens to resonate. My advice: Stop creating and start (and finish) documenting your content marketing strategy. Then get back to creating goal-focused content. We make time for what’s important. If anyone tells you that they don’t have time, what they are really trying to say is that it’s not important enough to MAKE time. My advice: If you can’t commit and go all in, stop creating content and go do something else. If no one in your company owns content marketing strategy, congratulations, it’s your responsibility. Content marketing, even though an old discipline, is still a new muscle in most organizations. If you are working with traditional marketers, I guarantee they aren’t going to think they need a strategic approach to content. My advice: You own it. Get started. Every week, send an amazing content marketing example to your boss; you can easily share the This Old Marketing example we discuss each week during our podcast, PNR with This Old Marketing. If you can, print it and send. You’ll gather support by educating your executives on why content marketing is important. Same as “no one owns this.” Are you really waiting for permission to create a content marketing strategy? If so, you’re killing me, Smalls. My advice: Consider it mentioned. Get it done. Consider a pilot program. “Under the radar” is another way to say “Our company doesn’t think content is important,” even though your organization most likely creates more content than ANYTHING ELSE in the organization. Believe me, at some point, some senior-level executive is going to ask the question why so much content is being created that can’t be measured. And when that day comes, they’ll be looking right at you. My advice: Show why content is important to your organization. Think about goals and measurement for every piece created. Boo hoo. Content, like everything else in an enterprise, is political. Sure, maybe it’s more political than most because it touches so many groups — sales, demand generation, events, human resources, customer services, finance, etc. My advice: Integrate the needs of other key departments into your content marketing strategy plan. If your plan helps them do their jobs better, then everybody wins. The content group or department has a special opportunity NOT to be a silo, so don’t act like one. Have you not been reading? It doesn’t matter if you are a team of one, you still need to write down your goals, understand your differentiated story to reach those goals, choose an appropriate content type and channels, distribute and measure the content, and then wrap it all in a beautiful orange bow by tying it all to the revenue. My advice: If the strategy is in your head, IT DOESN’T COUNT. A content marketing approach is completely different than most marketing approaches. The majority of enterprises still focus most of their budgets on interruption (advertising). The core of content marketing is about building audiences that trust and like you. Once you build a loyal relationship with your audience, you can start to measure how that audience generates revenue for the organization (or saves you money in some way). My advice: If content marketing is just part of your overall marketing plan, you probably have a marketing collateral strategy that looks like valuable content but is really direct marketing. It’s different, so treat it as such. Everybody has an excuse, but not one is a good one. If you create content as part of your job, it is YOUR responsibility to find or create the strategy. Someone, at some point, is going to ask why all this silly content is being produced. You better show them the plan and the results. What other reasons have you seen for companies not documenting their content strategies? I’d love to hear about them in the comments. Want to make your documented content marketing strategy even more effective? Attend Content Marketing University to learn how to create a strategy from start to finish. Register for winter semester by Dec. 31.